Cats and scratching. They go together like peas and pods. In fact, cats need to scratch to stay physically healthy and mentally well. Cats scratch to stretch and exercise their muscles, ligaments, and tendons and to keep their claws healthy. They do it because it helps them relax and let off steam if they get stressed out. Scratching helps cats mark their territory because it leaves visible marks and invisible scents for other cats to interpret. And, last but far from least, cats scratch because it feels good to them to do so. Trees are a prized scratching substrate for wild cats. They're perfect for helping a cat achieve all of their scratching goals. Trees are strong and solid, so they allow a cat to stretch and work their legs and shoulders without fear of injury. Tree bark shreds well under a cat's claws and is rough enough to hold onto odors from the scent glands in his paws, too, so he can leave clear territory messages for other cats. Trees provide a great variety in scratching surfaces so cats can exercise varying muscle groups and avoid the boredom that may come from having only one way to scratch. There are limbs, fallen branches, roots, and trunks with varying degrees of angle to them that allow cats variety in their scratching. Cats like to scratch on vertical, horizontal, and angled surfaces. When you are preparing the scratching environment for your cat in your home, think about trees. Provide strong, sturdy posts with a rough but shreddable surface in a variety of angles. Cats love sisal fabric for scratching, and corrugated cardboard is great, too, but a little messier. Make sure you have enough scratching surfaces if you have multiple cats, so they don't fight or grow stressed over lack of resources. Near favorite sleeping spots. Cats love to stretch and scratch when they first wake up. In high-traffic areas of your home. Your cat will want to mark this highly traveled area as his and show off to others. On every level of the house. 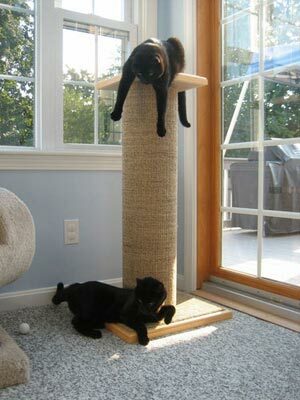 If your home has multiple levels, you'll need scratching posts on each one. A cat that suddenly feels the urge to scratch on the 3rd floor isn't likely to travel down two flights of stairs and across the room before giving in to his desire. Near windows. 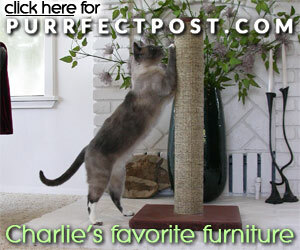 Cats love to look outside at what's going on, so cat trees and condos are especially good for placing near windows. And if your cat happens to see a feline intruder outside, which might make him want to mark his territory, he'll have the post right there to indulge his inborn urges. In hidden spots. Cats adore finding a stray scratching pad under the bed or behind the couch. You can buy extra inserts for angled scratchers and leave them in such places for your cat to find and enjoy. Basic post. You can't go wrong with a nice, sturdy, basic post. 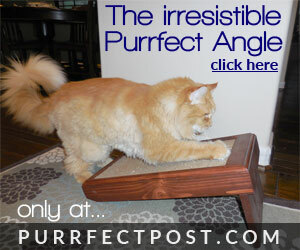 The Purrfect Post has great cat-satisfying scratching features. It's covered in sisal fabric, has a double-thick base so it won't topple over, and it's even attractive to the humans in the house, too. Basic post with a bed or perch on top. Cats love to climb and to be up high. It helps them survey what's going on below them, and it serves as stress relief for them. So a cat post covered in sisal fabric that has a perch or bed on top serves dual purposes of allowing a cat to stretch as well as to climb and perch. The Mondo is a wonderful basic, tall post that comes with either a perch (Standard) or a bed (Deluxe) on top. Cat tree. 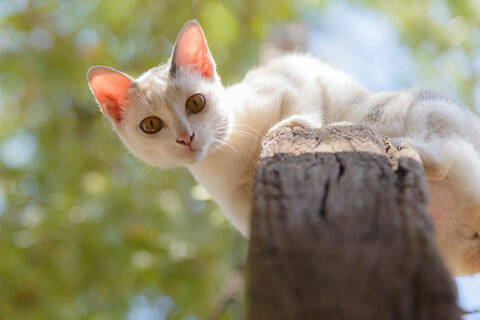 A tree like the Purrfect View provides a cat with two vertical posts and a horizontal base to scratch at different angles, plus two heights to which they can climb and perch. Placing the View next to a window is a great idea because the post heights are perfect for it. Cat condo. If you have multiple cats, a cat condo like the Command Center is the answer. Several cats can use these at once, choosing between vertical and horizontal scratching surfaces and varying heights of bed or perch. And if you only have one cat, the Command Center is the ultimate in feline spoiling. Angled scratcher. Small angled scratchers are a great way to add variety to your cat's scratching environment. You can place them near the base of another post, by themselves in a more confined area, angle them, or place them horizontally. Many cats like to keep their feet on the floor and scratch at an upward incline, then climb up onto the Angle and scratch at a downward incline. This stretches different muscles and gives them variety. The Purrfect Angle comes with either sisal fabric inserts, which are replaceable, or corrugated cardboard inserts, which are reversible and replaceable, so you can easily introduce different scratching surfaces to your cat. Remember, cats like a variety of scratching surfaces, so the more you can meet their needs with scratching posts, the less they will turn their claws to other items in your home.